The Government has made a decision to write off microfinance debt in regions affected by drought last year in an effort to provide relief to thousands of farmers struggling after poor harvests. Speaking at a Samurdhi Bank event at the BMICH on Thursday, Finance Minister Mangala Samaraweera said that that large numbers of people were indebted after being duped into taking loans from microfinance companies. “Even though poverty is at 1.9% in urban areas, it is at 4.3% in rural areas and 8.8% in plantations. In the poorest regions, such as Kilinochchi, poverty levels are at 18.2%. Mullaitivu, Batticaloa, Badulla, Monaragala and Trincomalee are all areas where poverty levels remain high. Even though Sri Lanka has the lowest poverty rate in South Asia, we still have to address income gaps within the country. 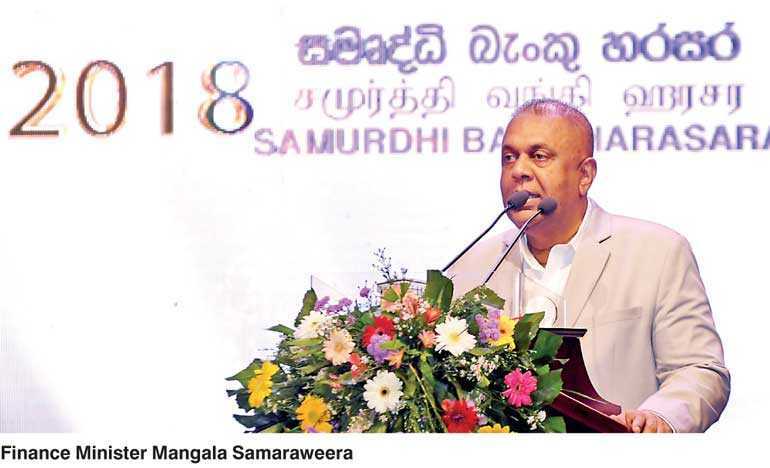 The poverty level that was 6.7% in 2012 has reduced to 4.1% today, and that is largely due to the efforts of the Samurdhi Bank,” Samaraweera told the Samurdhi Bank gathering. However, the Finance Minister pointed out that if Sri Lanka wished to reach the Sustainable Development Goal (SDG) of completely eradicating poverty by 2030, it would need to step-up its poverty alleviation efforts. The Minister recalled that more than 25 years ago, the Samurdhi program was established to expand the preceding “Janasaviya” program, but despite the lapse of nearly three decades, it had failed to rid the country of poverty. “Not only has Samurdhi not wiped out extreme poverty, it has now become a pawn of politicians. Public officials who became part of Samurdhi had to work according to the bidding of politicians. The entire structure of Samurdhi was changed to benefit politicians, and people who were not eligible for Samurdhi were given it under the previous administration. We hope to clean this system and ensure that only those who really need Samurdhi are given it in the future,” he said. Given that Samurdhi already has a strong presence in vulnerable areas, such as the hill country, it would be an effective system to implement the Government’s poverty alleviation measures. He contended that the Samurdhi Bank needs to be better managed so that it provides micro-financing to needy households. “We must use Samurdhi funds for the right purpose. If the Samurdhi Bank becomes active around the country, then people will not need to turn to microfinance companies that charge them exorbitant interest rates. They will have a source of capital with reasonable interest rates. It was only last year that the Samurdhi Bank financial results were properly audited. It is imperative that we develop the Samurdhi Bank, and run it in an efficient and professional manner so that it can become a platform for development. This is a timely effort of the Government in my view, and it is important to improve the transparency and accountability of the Samurdhi Bank,” he stated.